Every once in a while, I stop making new contents to actually correct all the issues present with the current game state. Every time I add a new mechanic, scripted event, boss battle, etc, new bugs appear. Also, in between versions of Game Maker, there are sometimes changes on how things work internally, specially in how strict variable initialization is in some scenarios. The last couple of weeks have been almost exclusively bug fixes, optimizations and balance. It's not the most exciting phase to write about, but it's very necessary. There were also a couple of playtest sessions, and now Zeta Metroids feel just right. They ended up taking more effort and tweaking than most of the bosses in AM2R (Maybe except Torizo). Up next will be a music production session, something that's lagging behind, production wise. Hopefully, I'll be able to show you something on the next update. Not the most exciting update, I know. But the game grows more stable and polished, a little bit every day. Any updates with progress are good, as it shows you're still plugging away. And debugging is progress, no doubt. Sounds like Area 4 is coming along pretty well now. Only Areas 5, the omega tunnels, and the final stretch left! Each day brings us closer and I can't wait, Doc. P.S. Yes, please share more music with us too. Your soundtrack result is as amazing as everything else. Bug hunting is absolutely necessary, but can be really draining. Be assured that polishing makes the release all the better. On the contrary, this is the most exciting kind of update! It's great to hear you're committed to maintaining such a high degree of polish. 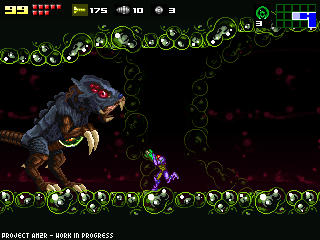 Glad to hear about the Zeta Metroids, and I can't wait until the next update! "Just remember that it only gets easier"
I was once in programming with C++ so I know that writing software code is 45% actually writing it and 55% is debugging. This update is actually very reassuring and only makes me more excited to see the end result! Good to hear things seem to be progressing smoothly (more or less)! Maybe not the most exciting update, but these updates are the most important, I feel. It's what makes this work-in-progress so enjoyable to play with every tech demo you release. Sounds awesome man thanks for the post about how things are progressing. Glad to see more and more stuff getting done! Keep up the great work Doc! This whole project is awesome. I've seen some *okay* fan games out there, but this is just amazing. The music, sprites, level design and gameplay are all on par with something Nintendo would make (or better). Even as a demo, it's still easily the best 2D Metroid game so far. I really can't wait for it to be finished. Keep up the good work. Man, this work of art is going to be amazing. The more boring and tedious aspects of game creation are nearly the most important parts. We all have faith in your work and your production speed. Keep up the good work. Omigosh I can't wait for the next demo. Its good to see you're progressing i believe you'll have area 4 in the next update! because of you im going to finish metroid 2! Progress is still progress, regardless of how minute it is. Once the game is finished we'll be able to play a Metroid 2 that doesn't feel like someone is shoving barbed bamboo under our nails, like with the original. This is an incredible game, worthy of Nintendo itself. Keep at it. I've been waiting years for this to be done, and, with your last demo, i can't wait to see the rest of the game. And, if Nintendo is smart and likes to make money, they will buy this from you to put on their eshop for either Wii u or 3ds (or both). They already have AVGN (Angry Video Game Nerd) the Game on there, which is another totally fan made game, and I know I would gladly fork over $10 for this game. Keep us posted. Can't wait until the end. I've been following this for a few years now I believe. If I remember correctly, the demo back then was just one area. Looking forward to the finished game! Hmm, the only way for process is bug fixing all the way to the end... Maybe after all of the bug fixes are done we can have an update to AM2R Version 1.4? Looking forward to the finished product, but wow is this taking so long to get ready! Love the soundtrack. It's everything one should expect in a Metroid game, elements of Prime and classic sidescrollers combined. I'd buy a soundtrack CD if published! Would you consider releasing the GMX files, say, from previous versions when you have a newer version out? Keep at it and don't worry, Metroid fans are patient fans. After all, we still don't have Metroid on 3DS. Or Wii U. Anyway, rushed games always turn out terrible, so please take your time with this. You don't want to have any regrets afterwards, do you? Do you think you could upload the game´s music to youtube? Awesome, keep up the good work. I've been keeping an eye on this game and inform people about this project whenever I can. Data structure with index does not exist. How can I fix this? Anyone know? Honestly, while this project is taking a small eternity, it's refreshing to see someone putting so much care and attention into this sort of project. Everything I've already seen has been awesome and looks like it was created by a team of Nintendo internal devs, so I know that when it eventually does get finished, it will be pure awesome. It's like what happened with Duke Nukem Forever, except the final product will almost certainly live up to everyone's expectations. I've just read through the early posts of your blog. Do you realize you're working on this project for about 10 years now? Take your time with the progress. I will wait patiently for the next update. I'm loving what you have so far and in comparison to the original, this is much better. I will be looking forward to the next update and then for the completed game. Keep up the good work! Definitely see this through 'til the end. I finished the demo and would undoubtedly play through the entire finished game. Thank you for the update, looking forward to the next demo. Could you make a "3d-less" version for those of us who can't even handle the smooth 3D effect of the 3DS? Heck, the images gave me a headache. How come the game maker system had some bugs? Is there going to be an update to the maker software? I was wondering, was it the Game Maker that has some bugs causing the project to stop or is it the design itself? I aid in a previous section that normal mode didn't have enough Gamma Metroids, but I take that back, there are plenty. Looks really awesome, and bug-hunting is always needed, so keep up the good work!!! Hello Milton, I've been checking on this page since your first post back in January (i think) of 2008, I've never commented before because I just created an account right now lol, I'm lazy, I know but I want to say I've been always looking forward to your updates and hope you finish the game asap (I can't wait to play it!). I fully support this game. I own the game boy version on my 3ds and its great and this game is making great into better!Metroid is cool and this game is also.Long live Metroid! This game is fantastic and I cant wait till the next update!! !